Stitched up two little generator covers today. Yes, two. Why two? Because we have two generators. Why two? Well, probably for the same reason we have two dinghys, two kayaks, two outboards, two propane tanks, two chartplotters, two VHFs……. You see, we are actually pretty simplistic when it comes to things we feel we want aboard. The problem, however, is when we do actually decide to make a purchase. The logic goes something like this: “if it is important enough to commit to one, we must need another”. Flawed, I know. 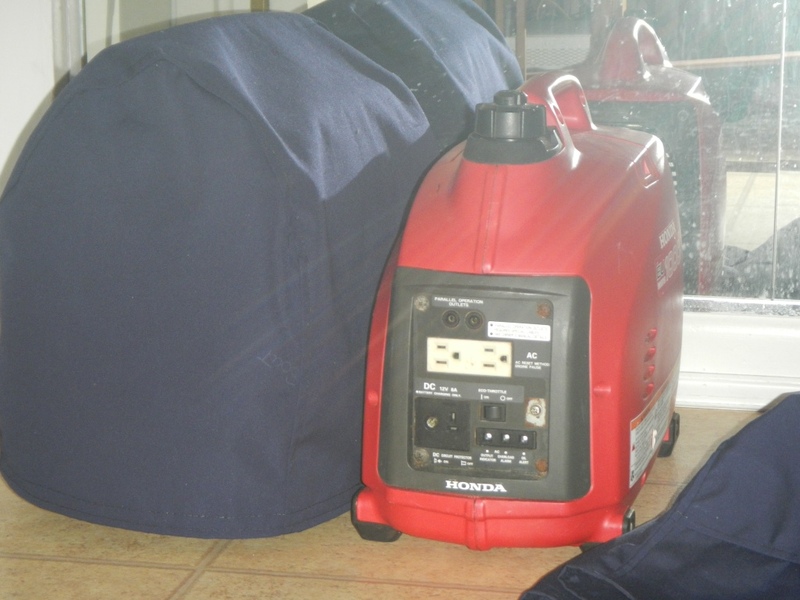 But I can explain…..
Two generators because one is tiny and old, a Honda 1000. In case it does not make it, we bought the new Honda 2000. So why not just take the 2000? Because the 1000 gets better fuel economy-and what happens if the 2000 breaks? Two dinghys because we are a multi-vehicle family. Period. Not up for debate. We have learned the hard way. While one of us is out running about in the dink (Keith), the other becomes abandoned, agitated, and angry (Deborah).Two dinghys to keep the peace. And just in case we lose one. Two outboards because, well, one for each dink. A big one for serious hauls to dive sites, town, and neighboring islands. A small one for running to the neighboring boat at cocktail hour without using up our entire cruising kitty the first year on gasoline. Two kayaks because sometimes you want to share the exploring. Although, we would love to switch these out for two paddle boards. Budget is not allowing, though. Two chartplotters because, to be honest, we found an identical one on craigslist for a crazy good price. We already had a back up GPS, but it is an important piece of equipment, so two. We leave the backup completely unhooked I case of lighting strike. Plus, only one set of electronic charts if we do have to swap it out. Two propane tanks because the original itsy bitsy three pound tank wasn’t going to handle all the bread making, grilling, and fish frying I am looking forward to. So, two twenty pound tanks and one happy galley.